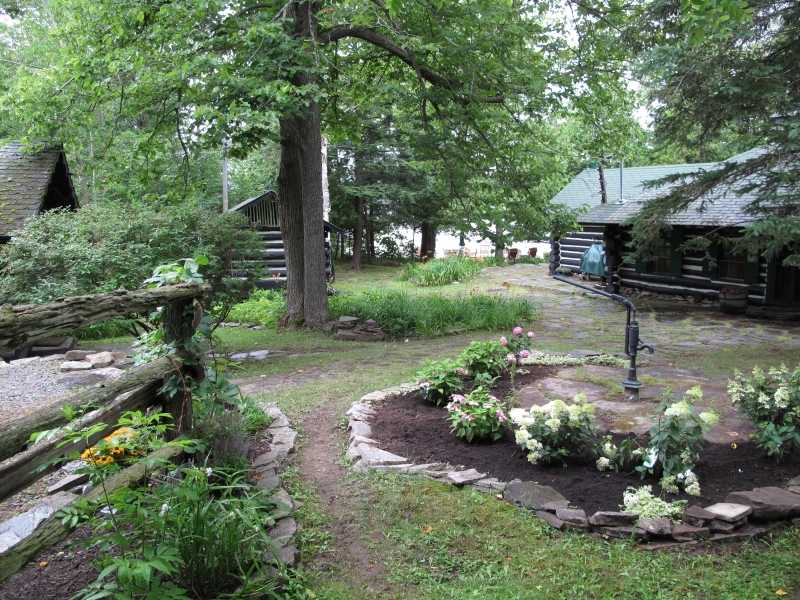 An aura of early Muskoka surrounds this lovely log cottage with beautiful gardens, that is wonderfully situated on Peninsula Lake near Huntsville and Algonquin Provincial Park. 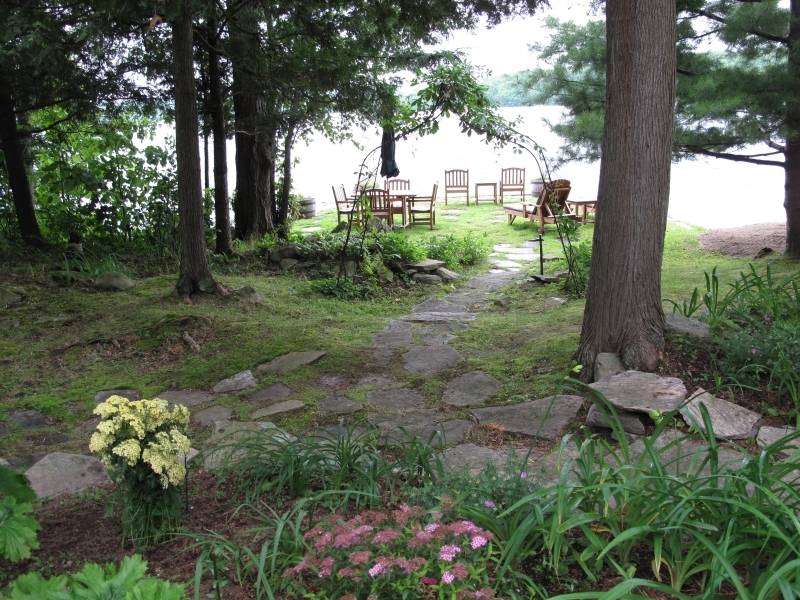 Water on three sides of the well-treed property enables a view of the lake throughout the cottage, good privacy, and the option of all-day sun or shade. 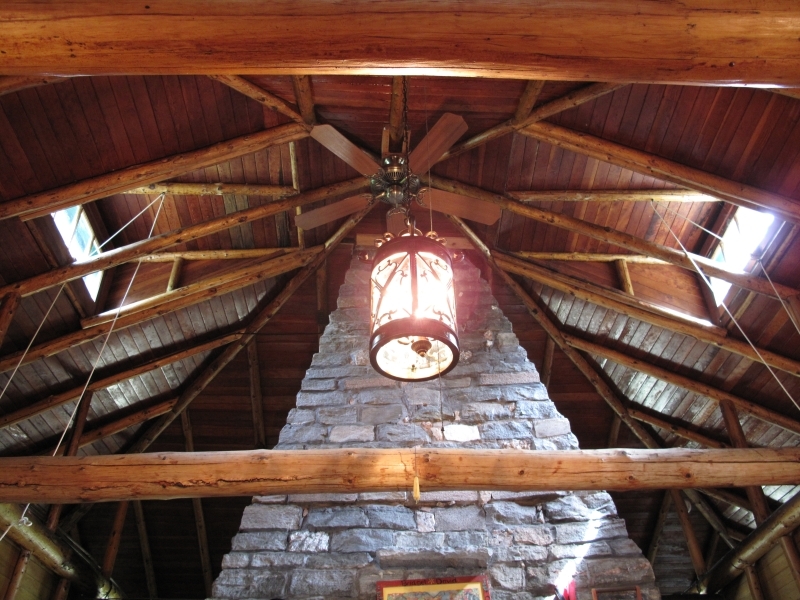 Antique-style furnishings, a log structure, a large screened porch facing the lake and a huge central stone fireplace give this cottage charm and character. The three-bedroom cottage is built on one level and has a large central living area with floor-to-ceiling stone fireplace in the center. Comfortable seating faces the fireplace, and a dining table is situated nearby with views of the lake and access to the galley-style kitchen. The kitchen is well-equipped with a mixture of newer and older styles in its full-size refrigerator, large Moffat stove, microwave and dishwasher. A door leads off the kitchen to a stone patio and large gas barbeque. 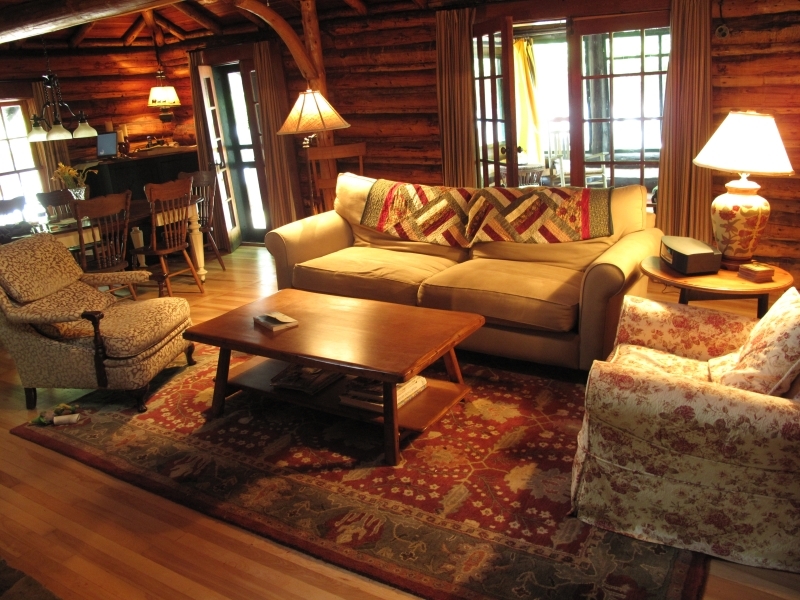 A second, smaller living area behind the fireplace beckons the card/game players of the group, or someone who wants to sit quietly to read one of the cottage’s many books. Two very large bedrooms boast queen-sized beds. Located on opposite sides of the cottage, each has a different lake view through large windows, along with exits to the outdoors. Antique and wicker furnishings complete the picture. A smaller third bedroom holds a set of bunks with double on bottom and single on top, and a spacious three-piece bathroom (newly added 6ft shower) with a door to the yard as well. 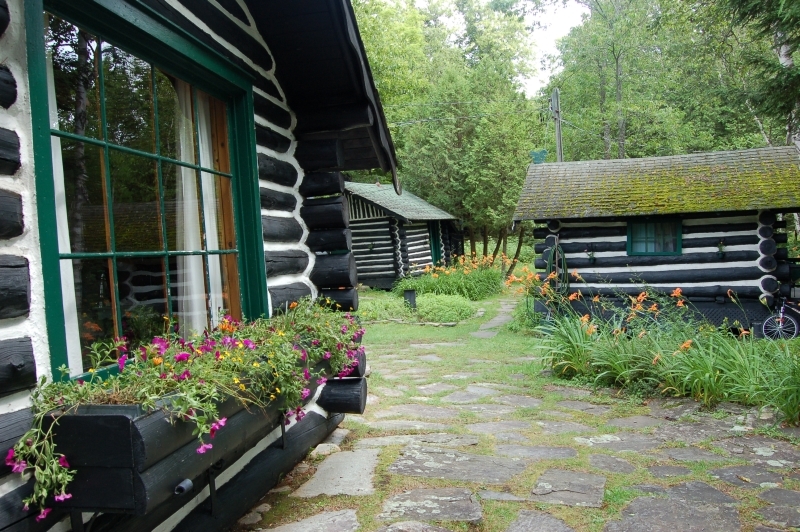 Near the main building is a guest cabin with additional sleeping (2 single beds). 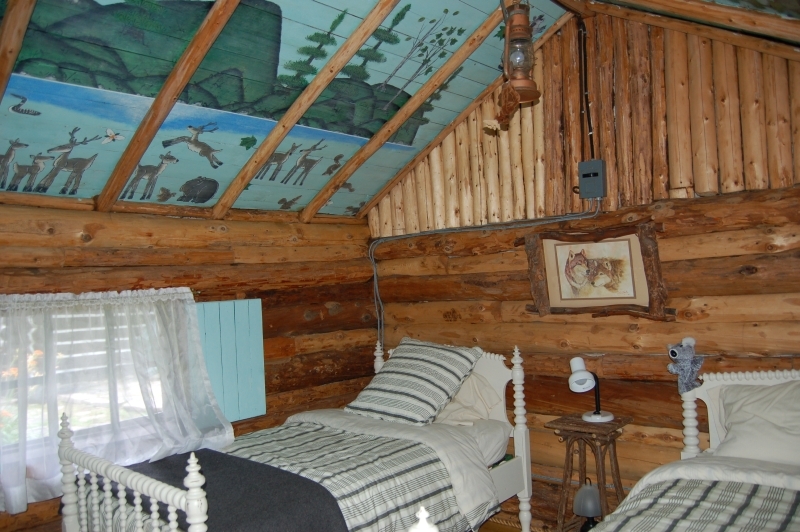 Charmingly decorated, the ceiling features a hand painted mural by a well-known local artist. The “Bump House” features a three piece bathroom (shower only). 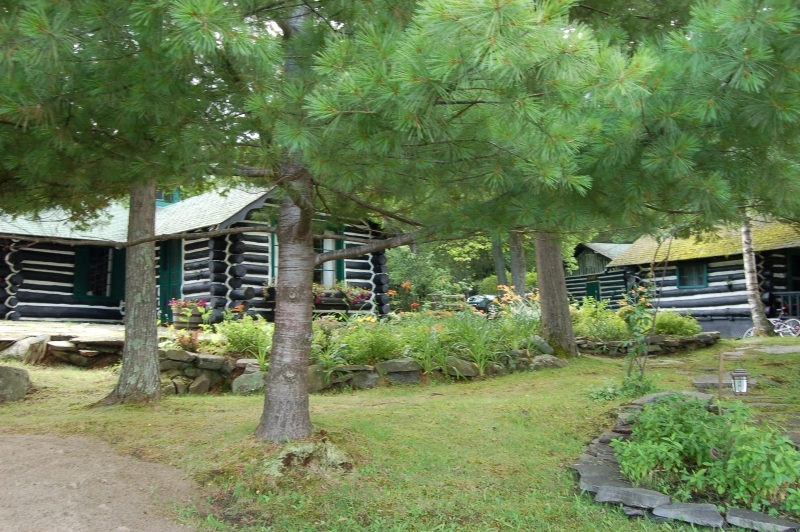 As the lot is level, the cottage can be easily maneuvered by people of all ages. 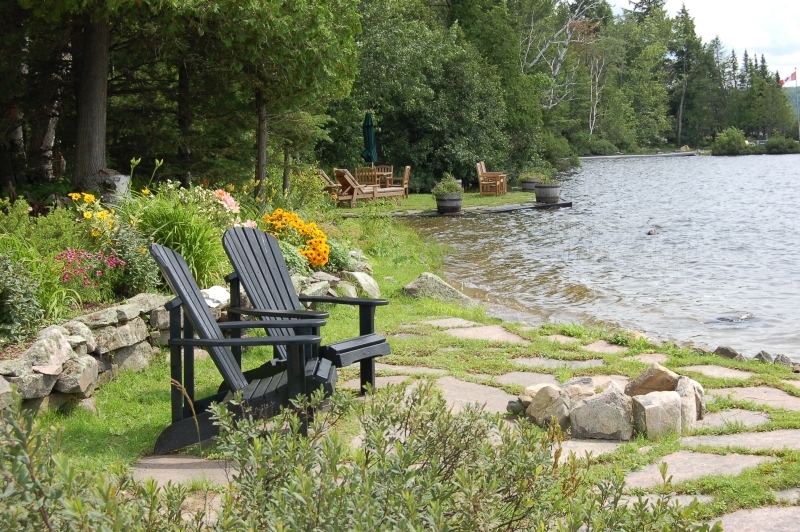 A large stone patio near the water is outfitted with chairs, table and umbrella and offers a good view of swimmers in the shallow water. A fire pit at the point will add to the atmosphere, while watching the sunset and sipping a cool drink. If deeper water is required, there is a choice of swimming areas. A dock is located where the water deepens, and so offers a place to moor a boat or to dive into the clean, clear water. Access to forty miles in a chain of lakes will be a tempting part of the holiday if a motor boat is brought or rented. The cottage comes with a canoe. 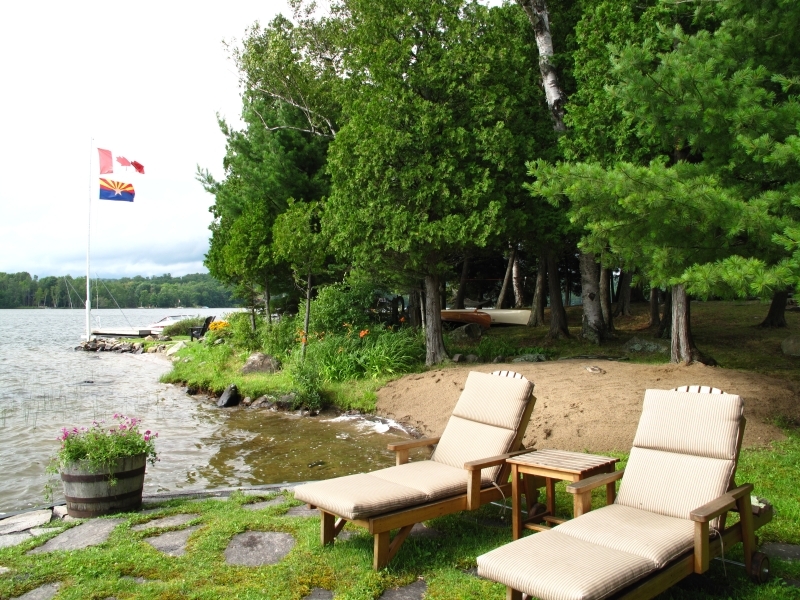 Only about twenty minutes to Huntsville by car or by motor boat, there is easy access to shopping, groceries, restaurants, live theatre and the Muskoka Pioneer Village. 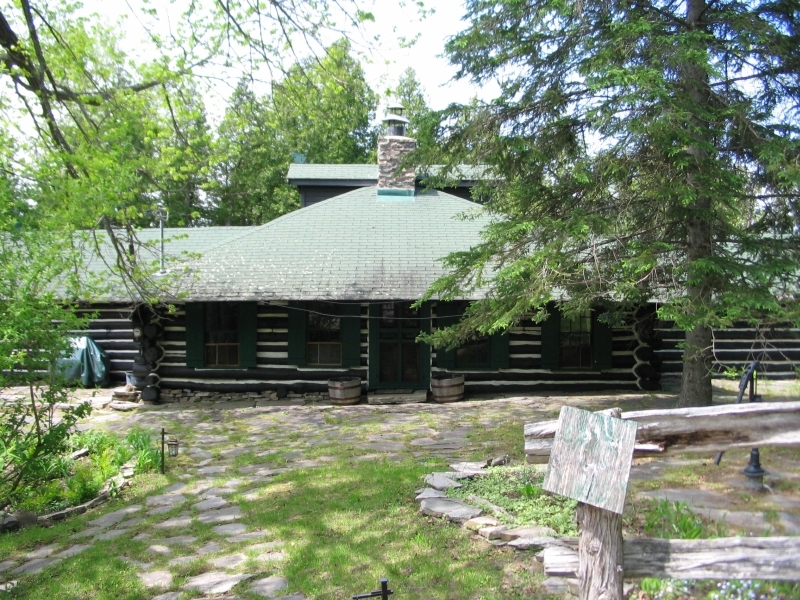 A day trip to nearby Algonquin Provincial Park will offer a change of scene, hiking trails, a nature art gallery, and a nature interpretive centre. The quiet roads around the cottage provide an option of pleasant exploration by bike or on foot. 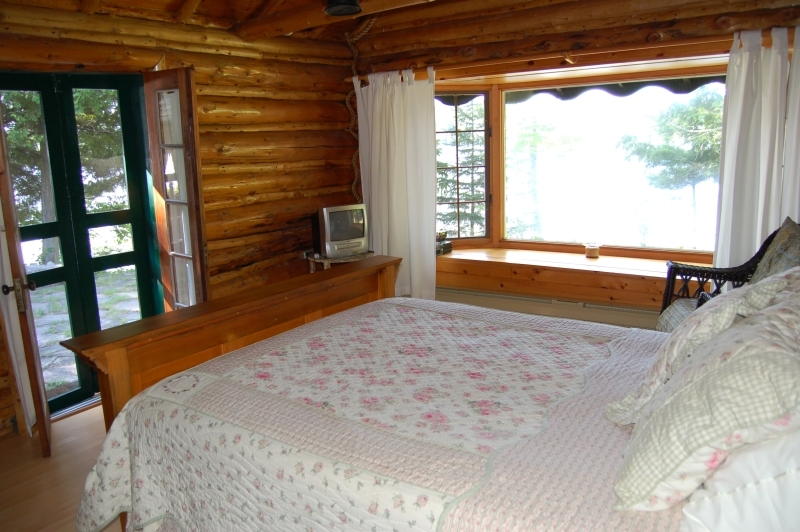 Come to Heritage Log Cottage for a comfortable and relaxing vacation! $1,850 per week during the off-season. 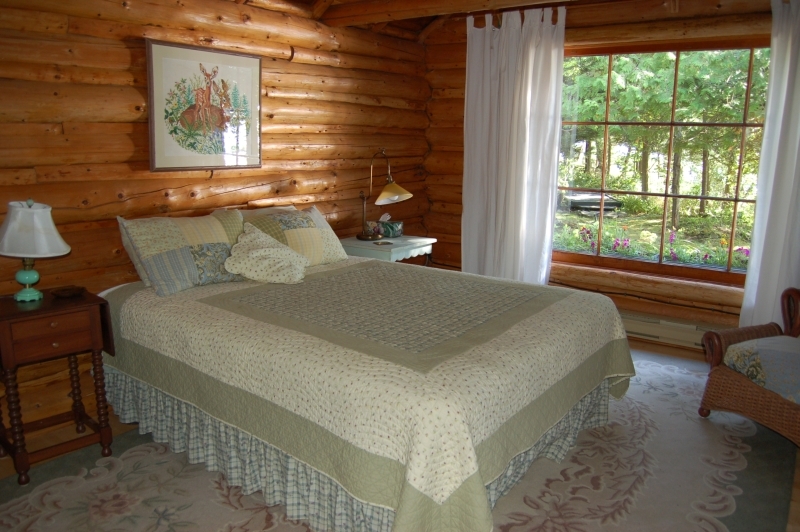 $440 per night during holiday weekends in off-season (minimum 3 nights).